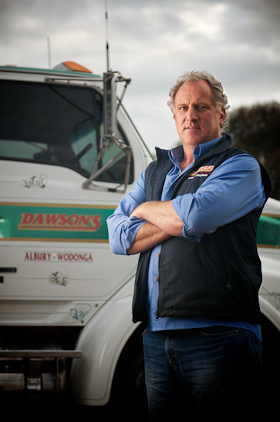 Dawsons Haulage is a Proud Australian owned, family operated company, established in 1990 with one Prime Mover. Dawsons Haulage has evolved into a specialised 40 Prime Mover, 70 Trailer Operation. Incorporating depots in Toowoomba, Rockhampton with Head office in a brand new purpose built site, including Workshop, Warehouse and Storage facilities centrally located in Baranduda (near Wodonga Victoria). Dawsons Haulage is owned and operated by Graeme and Tracie Dawson who pride themselves with their “hands on” day to day operations. Together Graeme and Tracie have 32years Experience in the Road Transport Industry. They have professional know how to get the job done. Prime movers, Extendable Trailers (up to 22metres length), Bdouble sets, Tautliner trailers, Flat Top trailers, Drop Deck Trailers, Container Trailers and All Terrain Forklifts. All Prime movers are fitted with IVMS Tracking that tracks your freight wherever it is in Australia. Updating our equipment regularly ensures we have the safest most efficient equipment to meet your business requirements. Employees of Dawsons Haulage are trained and kept up-to-date with Legislative changes, Industry standards and Best practice in all aspects of Road Transport. Workplace safety, Mass management and over Dimensional requirements from State to State regulations. For all your freight requirements, the team at Dawsons Haulage are ready, willing and able to help you. From a carton, to a pallet, to full loads, specialising in over dimensional items, please don’t hesitate to contact us.